But while skiing at Les Gets a couple of weeks ago, I could see in the distance a few cars at the top. I had to investigate. It turns out there are about 30 kilometres of nordic skiing trails at the Col and they try and keep the route open. – today was a little colder! On another perfect day, Eric and I set off from Morillon. As often happens on sunny winter days, it was far (far) colder down in the sun-starved valley. But after a five kilometre warm-up, we hit the steep but sunny lower slopes of the climb. Surrounded by high alps – including Mont Blanc – the ride was just too beautiful. Eric went ahead to stretch his legs, while I took the occasionally photo break, and enjoyed the mountain air. At the top, indeed were nicely groomed Cross-Country and hiking trails. As an added bonus, the little restaurant was open. On a sun-filled terrace with Mont Blanc staring us in the face, we enjoyed savoyarde beer and crepes. Nice! And then an authentic French cycling experience: The tremendously competent older lady running the auberge, came over to our table with some newspapers (The Dauphiné Libéré! ), and told us the descent would be cold and we should put these papers under our jerseys to shield the wind. Merci, Madame! Do not try this in winter on a road bike. While the road surface was generally pretty good, there was still plenty of ice around – and snow near the top. Love the story of the French lady concerned about your well-being on your descent. That’s priceless. Mh, and the little lunch picnic sounds perfect, too. 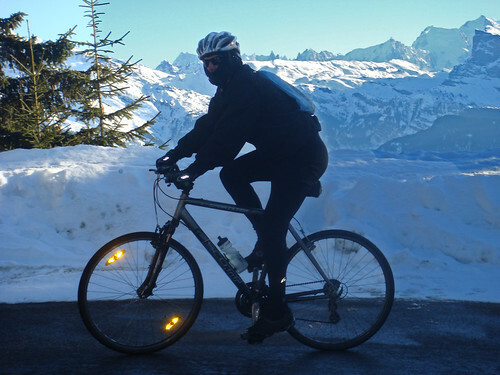 I am going to Morzine on 22nd of March and was wondering would it be possible to ride the Joux Plane on a road bike at that time of year – i presume you did it in the dead of winter? Do you have any knowledge of the road conditions that late in the skiing season? Cheers! The Morzine side of Joux Plane will definitely be closed – it’s a ski run. The famous Samoens side will possibly be do-able on a road bike – even if the road is marked as closed. 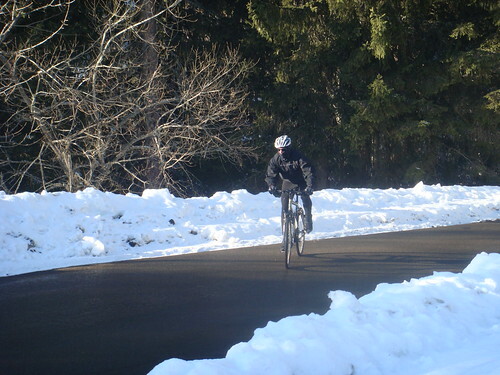 But almost certainly do-able on a non-road bike….. it just may be slippery up higher. I’m thinking then i can ride round on the D902 and D907 to Samoens, ascend either to the top or as far as i think is safe for coming back down, and go home the way i came? I’m presuming the more direct Route de la Manche and Voie Communicale No1 from Morzine to Samoens also goes over a ‘big hill’ and will not be rideable? Could you advise of any other road cycles that might be fun in late March? 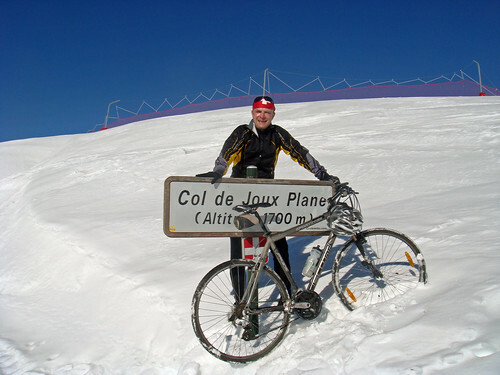 Is the Col de Joux Verte a no-no? To be clear, March is months too early usually on road bike, but if it’s been dry, the road will have been ploughed. Make sure you dress properly for any descent. Col de la Joux Verte is cleared but only the direct way to Avoriaz (you pass the Col nearing Avoriaz). The back way past lake Montriond is a ski run higher up – definitely closed. Plateau de Saix should be ploughed. Starts near Samoens – it’s also signed as Samoens 1600 or something like that. Search blog for map. Also the road up to Savolière (just short of Col de la Ramaz) should be ploughed. You could start in Morzine, head past Lesgets and then up to Savolière. Only do these though of it’s been warm and the roads are dry. 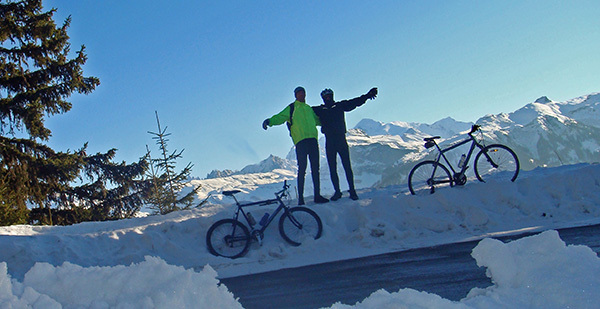 Finally, Flaine (Col de la Pierre Carré) isn’t too far away and is the highest nearby pass regularly open all winter.